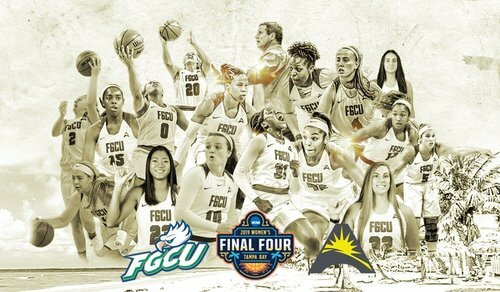 The FGCU women’s basketball team plays No. 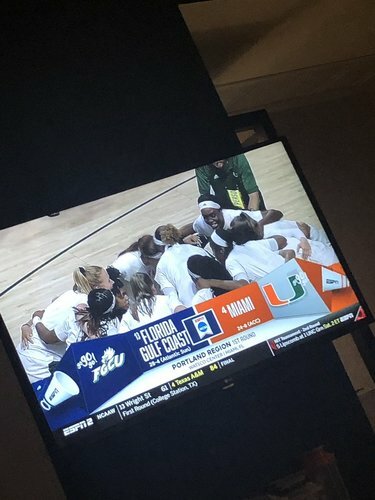 4 seed Miami in the first round of the NCAA tournament on the Hurricanes' home court, where they lost in controversial fashion by two points in the first round in 2017. Tournament time in Coral Gables! Very strong Eagle contingent in the stands and as a whole this is a very good crowd on hand. 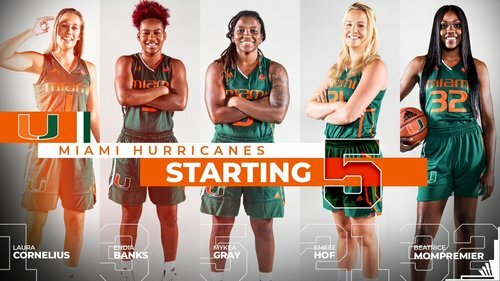 Big stat to keep an eye on for me is how well each team takes care of the ball; Canes can be TO-prone, Eagles force over 20 a game; can FGCU handle the pressure and get off to good start? 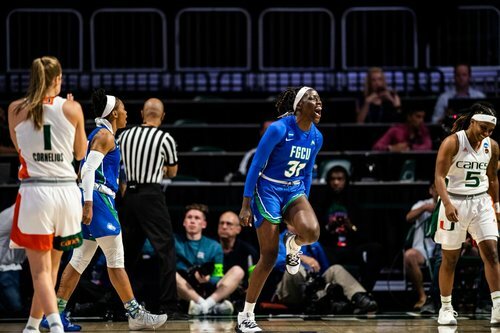 Kudos to the @FGCU_WBB fans - fine show of support for their team! Nice way to open the scoring. Back-to-back buckets by LC and Bea. Quick 7-0 lead for Miami. 1️⃣ | @DesWashington_ and @_CallmeKeroee hit back-to-back 3-pointers! 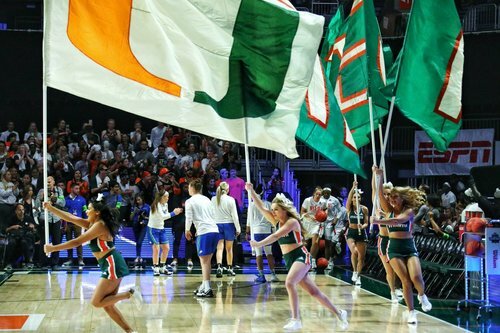 FGCU trails 10-6 and will have the ball after Miami's second turnover. 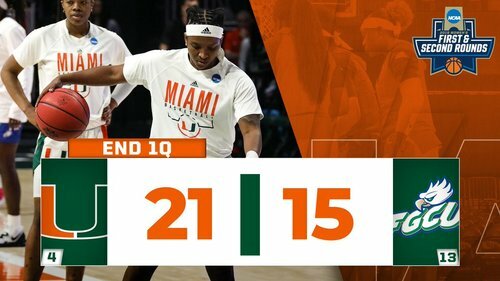 1️⃣ | The Hurricanes will have a FT coming up after our first media timeout. FGCU trails 14-6 with 4:53 remaining in the quarter. Yeah, Bea! And-one for the Miami native sends us to a media timeout. Free throw to come after the break. 1️⃣ | All of FGCU's FG attempts have come from 3-point range, and they're 2-for-8. Meanwhile, Miami is 5-for-7 from the field and 2-for-2 from 3-point range. Mompremier hits the free throw after the stoppage and extends Miami's lead to nine. 1️⃣ | @SheBe_PhillinIt enters the game with just under four minutes left. 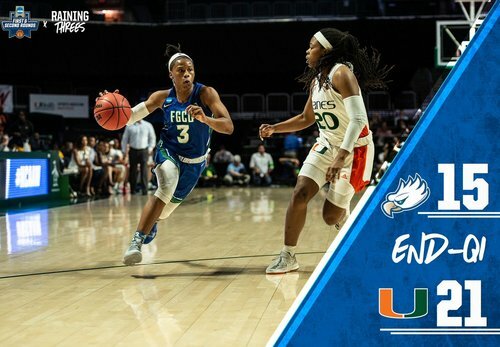 It's FGCU's first sub, and she promptly drains a 3-pointer, pulling FGCU within six. 1️⃣ | @1DavionW earns FGCU's first FT attempts of the game and makes both. The Eagles trail by 4. 1️⃣ | @chandlerryan4 and @tyti_42 enter off the bench. Gray gets fouled shooting a jumper with 2.1 seconds left in the quarter and heads to the line for a pair. 1️⃣ | Through one, FGCU trails by six. Five different players have three points for the Eagles. Here's some images from today's first quarter via @bradyoungphoto ! Bea hits a jumper for the first points of the second session. Miami leads by eight. 2️⃣ | @SheBe_PhillinIt came to play! She is now 2-for-2 from 3-point range as FGCU trails by five.